Fig. 5. Mice lung sections after CMC100 and nBCMC1, 10 and 100 treatments during 24 hr (40x magnification, scale bar = 200 μm). 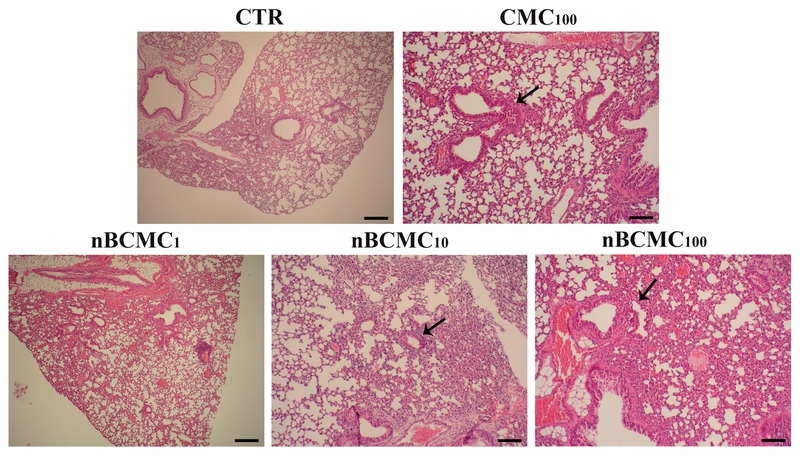 Treated groups presented mild diffuse degeneration of terminal bronchioles and mild multifocal to coalescing acute bronchioloalveolar inflammation, composed of neutrophils and macrophages that surround terminal bronchioles and occupy adjacent alveoli (arrows). Control groups presented normal lung histology.